The World of Cacti-How to Select From and Care For Over 1000 Species” by Danny Schuster, was published by Facts on File in 1990. This book is destined to be the most-thumbed one in your cactus library. It has everything you would expect from a great reference book, and really does live up to its title. There are four chapters, and each is brimming with helpful information. If you really want to be successful in growing cacti, it is best to check out the first three chapters. The first deals with the origins, classification, and native habitats of cacti. This information will help you provide the proper care and conditions for your cacti. There are drawings and color photos of the different shapes, and even a drawing and explanation of the different kinds of root systems. In addition, there’s an enlightening section on the different kinds of cactus flowers, illustrated with drawings. Within this first chapter there is a discussion on the classification of cacti. A lot of cacti don’t have common names, so that fact makes this section of the book an important one. Otherwise, the Latin names can seem like a foreign language. Following that, there is a chart of the botanical classification of the Cactaceae family that will be of interest to serious cacti lovers. 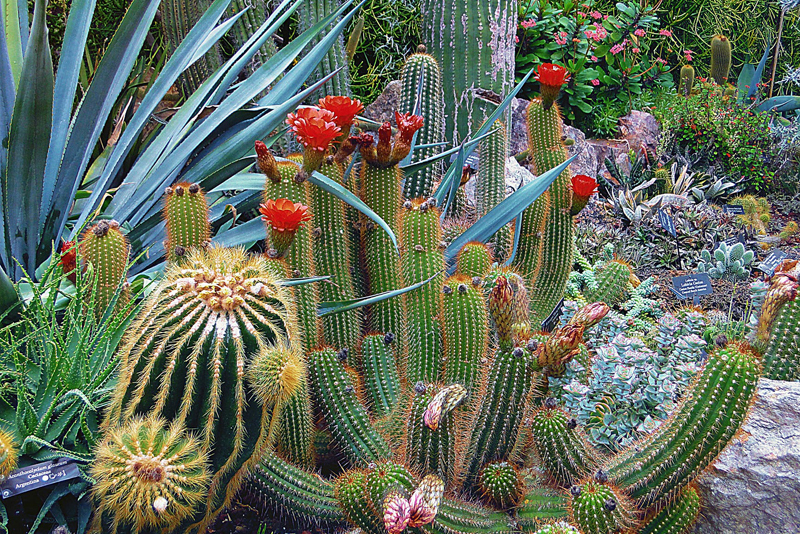 In order to keep your cacti thriving, you need to know something about their native habitat. Was it from the desert or from the jungle? The book has an enlightening section on that subject in the first chapter, in which the different habitats are discussed, such as true desert, desert grasslands, chaparrals, and subtropical forests. Chapters 2 and 3 deal with the nitty gritty of growing cacti. These give details on temperature, watering, soil mix, fertilizer, and other details on growing indoors, in greenhouses, and outdoors. There are detailed, step-by-step instructions on propagation by different methods, including grafting. In addition, the author discusses the different things that can go wrong, such as pests, rots, scarring, and deformation, and what to do about these conditions. You may be tempted to skip the first part of the book, and go straight to the encyclopedia of plants, which is the final and major chapter in the book. For each genera or species, there are color photos, often featuring the flowers. He provides detailed descriptions, information on propagation, lists of species, and notes of interest for each genus. For example, Copiapoa was once very popular. In the 1970’s they were very popular, but there seems to be little interest in them now. In the appendix, there is practical information that cacti growers will find to be helpful. There is a list of cactus groups, journals, and nurseries, and a glossary of technical terms. There is no doubt. Cacti lovers will find this book is useful and helpful.